A day after the American Bazaar reported that students detained in connection with the Farmington University have complained about conditions in their detention centers, Rep. Raja Krishnamoorthi, D-IL, launched a campaign to ensure the detainees are properly treated in detention centers. On Wednesday, the Indian American Democrat led a bipartisan effort to ensure that the students are afforded all rights available to them under law. Krishnamoorthi send a letter, co-signed by his congressional colleagues Thomas R. Suozzi, Rob Woodall and Brenda Lawrence to the Department of Homeland Security (DHS) and US Immigration and Customs Enforcement (ICE). The letter urged the two to ensure that the detained students are treated properly and are afforded all rights provided to them under law, including access to an attorney and release on bond for those eligible. The letter also asks DHS and ICE to share full details and regular updates regarding the Indian students with the embassy and consulates of India, and to facilitate consular access for the detainees. Some 129 Indian students are detained at different centers in the United States. The Indian embassy and consulates have been able to gain consular access to 117 of them and legal assistance is being extended to them. The students were detained last week, owing to their admission in Farmington University, a fake university set up by DHS. 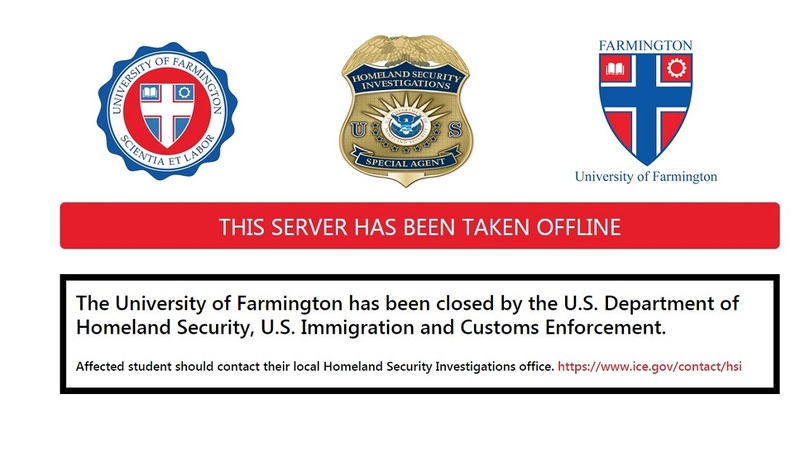 We write to you today with concerns surrounding the recent undercover operation conducted by U.S. Immigration and Customs Enforcement’s (ICE) Homeland Security Investigations (HSI), in which HSI special agents operated a fake university (“University of Farmington”) designed to target recruiters and foreign students believed to be engaged in immigration fraud. According to ICE, the investigation began in 2015, and HSI agents have been operating the fake school since 2017. [i] According to indictments unsealed last week, eight individuals served as recruiters for the school, enrolling hundreds of foreign nationals as students at the university. [ii] These eight recruiters have been indicted for conspiracy to commit visa fraud and harboring aliens for profit by the U.S. Attorney for the Eastern District of Michigan. According to news reports and the Government of India, many of the students enrolled in the school, and 129 of the 130 students currently detained by ICE as part of the operation, are Indian nationals. The Indian American community and Indian Consulate have expressed concerns regarding the treatment of these detained foreign nationals. We urge DHS and ICE to ensure the detained students are treated properly and afforded all rights provided to them under the law, including access to an attorney and release on bond, if they are eligible. We further urge DHS and ICE to share full details and regular updates regarding the Indian students with the Embassy and Consulates of India, and to facilitate consular access for the detainees. As you know, India is an important strategic partner and friend to the United States. In 2017, Indian students comprised 17.3% of all international students in our country, numbering over 186,000. These students are a vital pillar of the people-to-people exchanges between the two countries, and they come to the U.S. on grounds of merit. In the spirit of continuing cooperation on educational exchange programs, which benefit both countries economically and culturally, we ask that you ensure the students involved in this case are treated fairly, humanely, and in accordance with due process. We respectfully request that you provide our offices with an update on the detained students who are Indian nationals. Thank you for your prompt attention to this matter.